"If anyone watches Stargate, they will immediately recognize this technology. 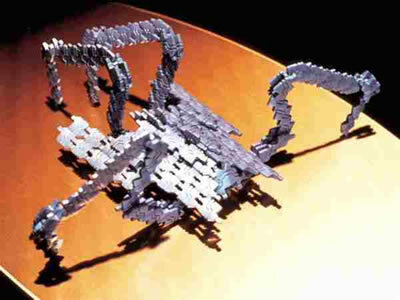 In those shows, this type of technology created an advanced race of beings called the Replicators, who have repeatedly been the villains on the show. Originally they started out as blocks in the shape of insects and later moved on to nanites taking human form, but it seems we're jumping the gun on robot evolution." "Here's a picture of the Replicators from Stargate. Read more about the Stargate Replicators." "Here's some video footage of the Stargate Replicators - note the sequence in which you see machine vision-style from the Replicator point of view. "Other SF related ideas are: A Fire Upon the Deep, by Vernor, Vinge calls its reality graphics Kiln People, by David Brin has similar stuff. Accelerando, by Charles Stross calls it Computronium "
"Thanks - see the new entries for computronium, dumb matter and reality graphics." "The most obvious example to me from the bestseller lists would be Michael Crichton's "Swarm," but the first instance surely goes back to the '80s somewhere when "nanotechnology" was first trendy ..."
"sorry, that's Michael Crichton's book called 'Prey' about biomechanical colony creatures called 'swarms'"
"I found this reference too funny not to list, I hope some of you appriciate it too. Shredder from the Teenage Mutant Ninja Turtles was at somepoint completely made of worms. The more I think about it the more cartoon and special effects scenes pop into my mind with biological connected components, maybe nanotech isn't the way to go here."